Soft, chewy and slightly sweet sugar cut-out cookies. They’re the quintessential holiday cookie in my opinion. In fact, I’ll make a bold claim now and say that it never really feels like the holidays until these festive cut-out cookies make their appearance! Do you have a favorite cookie like that? Let me tell you about my family’s favorite, vegan sugar cut-out cookies. I have fond childhood memories of me and my brother baking sugar cut-out cookies with my mom — carefully cutting out cookies with our favorite cookie cutter (mine was a duck), placing them gently on a cookie sheet, slightly burning them in the oven, and topping them with an array of bright, artificially-colored red and green sprinkles — that I think about every time I make these cookies. I treasure these memories even more now that my mom has passed away. The cookies of my childhood were packed with a variety of animal products — butter, eggs, artificial food coloring, beeswax — which isn’t very vegan-friendly at all. These days I make my sugar cut-out cookies vegan, and I make them artificial color free. But that doesn’t mean that I bake them with less flavor or make them less pretty. I’ve tested lots of recipes for vegan sugar cut-out cookies and royal icing, each not quite capturing that flavor and nostalgia of the cookies from my childhood. Sometimes it’s because the cookie isn’t right, other times it’s because the icing is wrong. So I set out to make my own. I wanted a sugar cookie with a soft, lush texture while still being sturdy enough to hold a cut-out shape and decorations well. I also wanted a less sweet cookie to balance the sweetness of adding sugar icing or decorations later. It was actually something that my maternal grandma said to me that made this recipe click: “Everything is better with cream cheese.” She was talking about dairy cream cheese no doubt, but she’s right. Everything is better with cream cheese. Or, “mmmm.” You know, whichever. Let’s talk cookie dough for a minute. If you’ve ever made vegan sugar cut-out cookies before, you know how important it is to have nice cookie dough to work with. If it’s too wet, the dough will be too sticky, if it’s too dry it’ll crack and fall apart. The perfect cookie dough should be soft, pliable and easy to roll. That’s what this dough is. Even after it’s rolled and cut and rolled again, it’s a dream. It’s the perfect cookie dough to use with your favorite cookie cutters. This dough works best if you let the dough warm for a few minutes before using. I like to make my cookie dough a day before I want to use it. Then later, I can just pull the dough out, let it warm for about 15 minutes, and I’m ready to make the vegan sugar cut-out cookies. Food colors and brightly colored sprinkles are ubiquitous in baking sections of grocery stores across the U.S. Made from chemicals and sugar; these products don’t overtly appear non-vegan, so it’s easy for people to overlook them. The food dyes found in most grocery stores — produced through the wonder of chemistry and the industry of oil drilling — are something we all should avoid. Not only are they harmful to human health, but artificial food coloring is also or were also subject to animal testing. And those cute sprinkles? They’re made with refined cane sugar, beeswax, and artificial food coloring. AKA: bone char, an animal product, and animal testing. Instead, look for colored sprinkles made with things like raw sugar, natural colors, and carnauba wax, made from the leaves of the palm plant. As an alternative to artificial colors, you can learn to make a rainbow of colors from plant-based ingredients you probably already have in your fridge or spice rack in this tutorial, Homemade Food Coloring (All Natural + Vegan). If you would prefer to buy natural, petrochemical free dyes and sprinkles, no problem. India Tree has a line of food dyes and sprinkles, colored only with vegetable juices or spices, and are vegan-friendly. I use the India Tree sugar and colors myself, and I love them. Some people have said that they can taste the foods used to color each of the different sugars — the spinach of the green sprinkles for example — but I have never had that experience myself. I have tested each color and only taste sugar and nothing else. This India Tree Decorating Sugars Variety Set and this 3-pack of India Tree Natural Decorating Colors Set makes a great starter set and both are vegan-friendly and free of artificial junk. A note about India Tree Sprinkles: Not all products are vegan-friendly. Some varieties contain beeswax so be sure to check the label before ordering. The cookies featured in the photos were topped with royal icing and then decorated with the blue natural color sugar from the India Tree Nature’s Color line, Let’s Do Organic Multi-Color Sprinkelz, organic snowflake sprinkles made with carnauba wax, organic sanding sugar I found in the bulk section of my local health food store, and an organic peppermint candy cane that I broke into pieces. A soft, slightly sweet sugar cookie perfect for cookie cutters. Preheat oven to 350° and line a cookie sheet with parchment paper. Set up cooling racks. In a large bowl, cream the softened vegan butter and the sugar together until fluffy. Add the egg replacer "eggs," softened cream cheese, and the vanilla to the same bowl. Mix until combined. In a separate bowl, add the flour, baking powder, and cinnamon. Stir together. Using a spatula, gradually stir in the dry ingredients into the wet mixture until the dough is formed. Wrap the dough in plastic wrap and set it on a plate in the fridge to chill for several hours or overnight. When ready, take the dough out of the fridge and let stand for 15 minutes before working with it. Sprinkle work surface with a little flour and place some of the dough in middle to be rolled out. 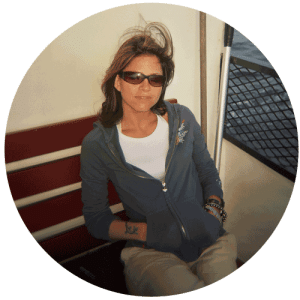 Dust the top with a little flour and roll the dough out to about 1/8″ thick – the thicker the cookie, the longer the bake time and conversely, the thinner the cookie, the shorter the bake time – or a thickness you prefer. Use your favorite cookie cutters to cut out cute shapes. Place cookies on lined cookie sheet and bake for 10 – 12 minutes. Bottoms will be barely brown when done. Start checking on the cookies at the ten minute mark- don't let the bottoms get dark or it drys out the cookies. You're looking for a barely brown on the bottoms. Remove cookies from the baking sheet and let cool on cooling racks. Cookies should be completely cool prior to decorating. Make sure butter and cream cheese are at room temperature (softened but not melted) before beginning. These cookies keep well in an air-tight container placed in a cool location. They also freeze perfectly so feel free to make a batch or two for later. Now, about that royal icing. A lot of royal icings are made using egg whites, obviously not very friendly for us vegans (or chickens for that matter). 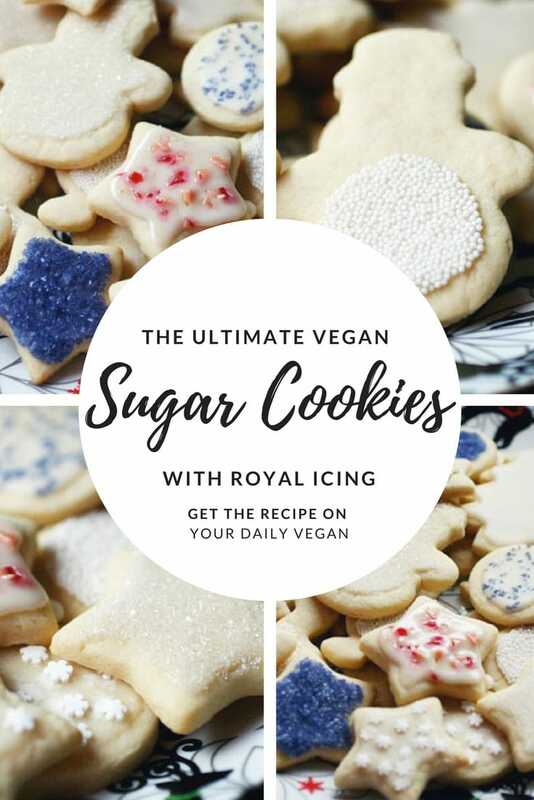 Instead, you’ll want to make a batch of vegan royal icing for your vegan sugar cut-out cookies. That’s where I come in with this vegan royal icing recipe to save the day. Fair warning friends: This stuff is the real royal icing deal. It sets quickly, so if you want to add sprinkles to your vegan sugar cut-out cookies — and you know you do — do it immediately after icing the cookie. You can dip your cookies into the icing, or if you want to get your inner Martha Stewart on, use a food-safe paint brush and brush it on. I’ve done both. This icing is a perfect base for other flavors of icings, experiment with lemon, orange, or cinnamon flavors. It’s off-white in color, but you can add color to it if you like. Experiment, have fun! A quick-hardening sweet icing perfect for decorating. Place sugar in bowl, add non-dairy milk and whisk until smooth. Add the almond and vanilla extracts along with the corn syrup. Whisk until smooth. The icing will be shiny and just a little runny. You don’t want it really runny or the icing won’t stick to the cookies. Icing will be hard with a shiny finish once dry. You can either dip cookies into icing, paint it on with a food-safe paint brush, or in a pastry bag. Are you ready to get baking? I hope I’ve convinced you to make a batch of these vegan sugar cut-out cookies. If you do, leave a comment to let me know how it goes or tag me on Instagram at #yourdailyvegan! This article contains affiliate links; I will be compensated if you make a purchase after clicking on my links. Thank you for the support! Read my full affiliate disclaimer. How would you add the natural food dye to the icing? I tried with another icing and it made it runny. These cookies look wonderful and I am planning on baking them to bring to a party! My question is- is the 3/4 cup flour saved to sprinkle on rolling pin etc to cut shapes, or is it mixed in with the rest of the batter? I’m wondering because most other recipes have flour to sugar ratios at 3:1, therefore 3 3/4 C flour looks suspicious. Also, could you please give me a more approximate estimate on how many cookies the recipe makes? hello :) I was just wondering if any syrup will do, or if it has to be light corn syrup for the consistency and hardening factor? I realize maple syrup will change the colour and flavour, but it is what I always have at home. Hi Diane, it is the vanilla that turns the icing into an off-white color. You can avoid that by using a vanilla bean- though the icing would then have flecks of vanilla in it- or by leaving out the vanilla completely. I used vanilla in mine in the photos and didn’t find that it was too far from white to bother me but it really depends on the look you’re going for :) I talk a little bit about this above but, you can add other flavors too which would help with the color. For instance, keep the almond extract but don’t add the vanilla- in its place add a bit of lemon juice for a lemon flavor. That will keep your icing white. Can I make the icing the day before? Thank you for sharing your recipe. You saved the day! For the past two years we’ve made number cookies for my son to share for his birthday at preschool. This year he has a classmate allergic to dairy and we didn’t want her to feel left out so I searched for a recipe and tried yours to rave reviews! You should have seen her face light up and eyes sparkle when she asked if they were vegan and we were able to say, “Yes! We made them that way just for you.” You made a preschooler’s day! Really two, because my son was excited his friend would be included. My only alteration was the icing which I made into more of a glaze. I used 1C confectioners sugar, 3T water, and 1/2t vanilla.